Kamdhenu Agro Machinery offers Rice Mill Machinery having efficient and excellent Commercial Viability, both for Indian and International markets. The Rice Mill Machineries are simple in design and serve the varying needs of the end users without much complexity. Kamdhenu Agro Machinery (KAM) offers Single Pass Rice Mill Including Husker and Polisher having efficient and excellent Commercial Viability, both for Indian and International markets. The Single Pass Rice Mill Including Husker and Polisher is simple in design and serves the varying needs of the end users without much complexity. Single Pass Rice Mill Including Husker and Polisher having Capacity 450 - 500 Kg. / Hr. with 10 HP Three Phase Electric Motor with Shaft Speed 1400 RPM. Easy to use, operate and carry. 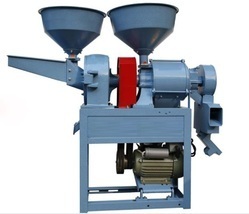 The Kamdhenu Single Pass Rice Mill Including Husker and Polisher can be used in any country. For more details, please drop in an inquiry, with your full name, complete address and contact information. Kamdhenu Agro Machinery (KAM) offers One Pass Rice Mill Including Husker and Polisher having efficient and excellent Commercial Viability, both for Indian and International markets. The One Pass Rice Mill Including Husker and Polisher is simple in design and serves the varying needs of the end users without much complexity. One Pass Rice Mill Including Husker and Polisher having Capacity 450 - 500 Kg. / Hr. with 10 HP Three Phase Electric Motor with Shaft Speed 1400 RPM. The Kamdhenu One Pass Rice Mill Including Husker and Polisher can be used in any country. For more details, please drop in an inquiry, with your full name, complete address and contact information. Capacity 150 - 200 Kg. per Hr. Kamdhenu Expeller Industries (KEI) offers Mini Rice Mill having efficient and excellent Commercial Viability, both for Indian and International markets. The Mini Rice Mill is simple in design and serves the varying needs of the end users without much complexity. 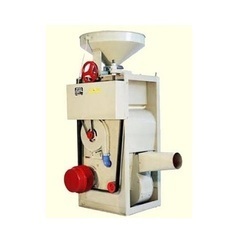 Mini Rice Mill having Capacity 150 - 200 Kg. / Hr., with 3 HP Single Phase Electric Motor. Can be used on Domestic Electric Supply and consumes less electricity. 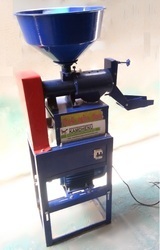 The Kamdhenu Mini Rice Mill can be used in any country. For more details, please drop in an inquiry, with your full name, complete address and contact information. 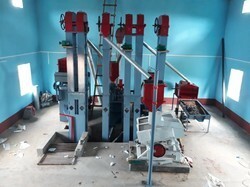 Kamdhenu Agro Machinery (KAM) offers Rice Mill Plant 1 Ton / Hr. with Electric Control Panel and Bucket Elevators having efficient and excellent Commercial Viability, both for Indian and International markets. The Rice Mill Plant 1 Ton / Hr. with Electric Control Panel and Bucket Elevators is simple in design and serves the varying needs of the end users without much complexity. The Kamdhenu Rice Mill Plant 1 Ton / Hr. with Electric Control Panel and Bucket Elevators can be used in any country. For more details, please drop in an inquiry, with your full name, complete address and contact information. Kamdhenu Expeller Industries (KEI) offers Combined Mini Rice Mill and Flour Mill / Dry Masala Grinding Mill having efficient and excellent Commercial Viability, both for Indian and International markets. The Combined Mini Rice Mill and Flour Mill / Dry Masala Grinding Mill is simple in design and serves the varying needs of the end users without much complexity. Suitable for Residential usage, NGOs, Self-Help Groups, and Small Scale Industries. The Kamdhenu Combined Mini Rice Mill and Flour Mill / Dry Masala Grinding Mill can be used in any country. For more details, please drop in an inquiry, with your full name, complete address and contact information.